Many people around the world today, don't believe in Testimonies, some don't believe in what God can do, and some don't even believe that God exists. But deep inside of us, we all know the truth.God is truly working in the lives of many who believe in Him, It's the only when you have belief and trust in Him That He will give you what you desire from Him. Testimonies are evidence or proofs of something that happened to one. Testimonies are what moves God, according to the word of God in (1John 5:10) New Living Translation "All who believe in the Son of God know in their hearts that this testimony is true. Those who don't believe this is actually calling God a liar because they don't believe what God has testified about his Son". Many of us today have made God a liar unknowingly, while some have done it knowingly and refuse to accept correction when it was given to them. Appreciation is an application for more, the more we appreciate God what He Has Done in your Lives the more he does for us. An English word says: If You don't appreciate, you will depreciate, so for you not to depreciate, you must appreciate. IF you Show to God how grateful you in just a little thing he did for you, you are telling him how grateful you will be when he does something bigger than that for you. Therefore, you must be among the testifiers, as you are reading this post today, you must know that you should be among the testifiers of the goodness of God both inside and outside of you, just like in His word in (Psalm 22:22) "I will praise you to all my brothers; I will stand up before the congregation and testify of the wonderful things you have done. . Learn to be appreciative unto God, then he will send you things that you never expected from Him in nearest future". In other words, testimonies quicken our expectations to be granted more than the time we ever expected it to come. 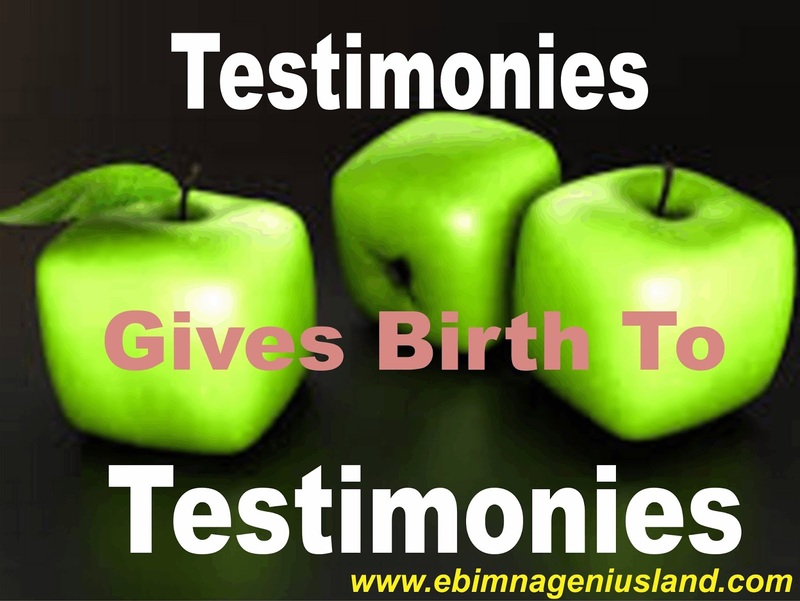 How Do Testimonies give Birth to Testimonies? *See yourself in the shoes of the same individual sharing the testimony. *Celebrate them that are celebrating the good things. *Bring your own condition to God in reference to what He has done for the individual sharing his/her testimony. *Finally, believe that the same God that did for him/her sharing that testimony will do it for you, and above all, declare that the Lord has done it for you and give him thanks. These are just common ways to grab what you want from your maker and stop complaining, many people has turned the way they communicate with their maker to complain, A testifier of the goodness of God will never be a complainer, but instead he/she will continue being a testifier through out his/her existence here on earth.